I've made a simple Max/MSP patch that allows the user to simply pass MIDI data to it in the form of a monophonic, single channel note stream, which then copies the data to multiple channels with a predefined amplitude multiplier and cascaded delay. 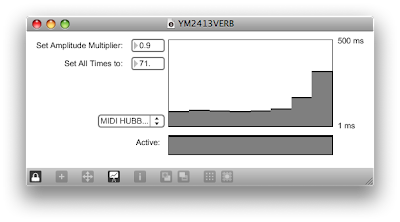 The result is easy data-based reverberation for the YM2413. he basically explained how to do it- it doensn't have to be HIS patch... make a variation or attempt. thanks a lot little-scale, very cool idea and inspirational!